Burnet Institute, as part of a consortium of institutions led by Menzies School of Health Research, has been awarded funding via DFAT for a project that aims to strengthen operational research capacity for TB in PNG through structured training, mentorship and jointly conducting research that meets program and health needs. The goal is to establish Daru as a regional Centre of Excellence for research and training in drug-resistant TB (DR-TB). In so doing, the project will build the capacity of a range of PNG institutions, including Provincial Health Offices, the National Department of Health, PNG Institute of Medical Research, and the University of Papua New Guinea. Develop a Western Province TB program operational research agenda that enables a more effective response to TB and strengthens the health system. Conduct structured operational research training for staff from key PNG health and research institutions. Strengthen the capacity of the Western Province TB program to measure the impact of programmatic interventions for TB and evaluate the pilot model of care, to enable scale-up. 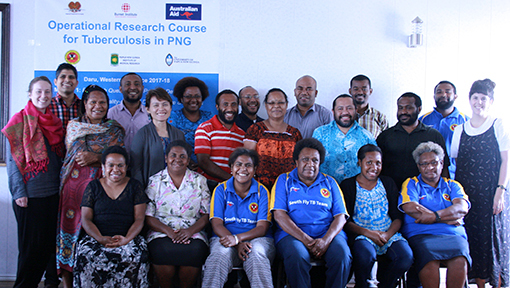 A two-day research priority-setting workshop for TB in Daru, which involves participants from key PNG health and research institutions. This will embed ownership of the research agenda within the relevant PNG stakeholders. Structured operational research training, which will include methodology used by the WHO and Burnet Institute in the PNG National Health and HIV Research Agenda (funded by DFAT). The methodology will be based on the successful Union/MSF/TDR SORT-IT model of operational research capacity building. Twelve PNG participants from key institutions will receive hands-on mentorship to conduct their own operational research project, as part of a three-week course conducted in two modules over 18 months. The SORT-IT project complements the DFAT-funded Reducing the Impact of Drug-Resistant TB (RID-TB) project and the PNG Department of Health’s South Fly District Accelerated Response Plan, which include designing and conducting research to test interventions and innovations that will increase the efficiency and impact of the TB response in Western Province. The pilot of a state-of-the-art data system for TB (including electronic medical records and mobile health innovations) in Daru, enabling improved data quality and real-time reporting. Ultimately ensuring quality operational research through robust data systems and trained human resources. This project is a consortium led by Menzies School of Health Research, Darwin, Australia, in collaboration with the Burnet Institute, PNG Department of Health, PNG Institute of Medical Research, and organisations in Indonesia and Malaysia.